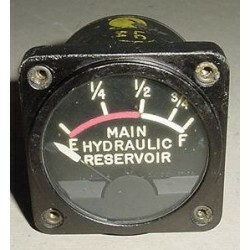 2 1/4" Vintage Warbird Aircraft Hydraulic Fluid Reservoir Indicator. 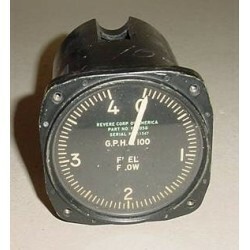 Manufactured by The Liquidometer Corp. P/N EA102AN-54 or 626098. 2 1/4" Vintage Warbird Aircraft Hydraulic Fluid Reservoir Indicator. Manufactured by The Liquidometer Corp. P/N EA102AN-54 or 626098. Very clean item. 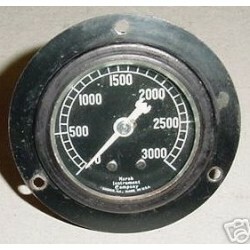 It shows very well and it would make an excellent show piece for the bookshelf in the office or home or just as a mock up panel i..
2 1/4" Vintage Warbird 3K PSI Hydraulic Pressure Indicator. 2 1/4" Vintage Warbird 3K PSI Hydraulic Pressure Indicator. Very clean item. It shows very well and it would make an excellent show piece for the bookshelf in the office or home or just as a mock up panel item. 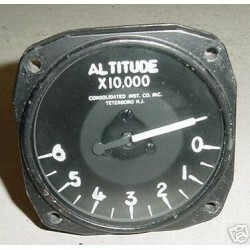 Do you happen to know the type of aircraft this indicator came off?.. 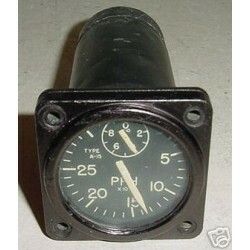 3 1/8" Vintage Warbird Jet Altitude Indicator. Manufactured by Consolidated Instrument Company. P/N C69-AIT-0-6. Very clean item. It shows very well and it would make an excellent show piece for the bookshelf in the office or home or just as a mock up panel item. 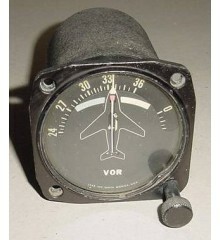 3 1/8" Vintage Warbird Jet Altitude Indicator. Manufactured by Consolidated Instrument Company. P/N C69-AIT-0-6. Very clean item. It shows very well and it would make an excellent show piece for the bookshelf in the office or home or just as a mock up panel item. Do you happen ..
3 1/8" Vintage Warbird Jet Fuel Flow Indicator. Manufactured by Kollsman. P/N 1224-8-018 or F-2058. 3 1/8" Vintage Warbird Jet Fuel Flow Indicator. Manufactured by Kollsman. P/N 1224-8-018 or F-2058.Very clean item. It shows very well and it would make an excellent show piece for the bookshelf in the office or home or just as a mock up panel item. Do you happen to know the ty..
2 1/4" Vintage Warbird Jet Rate of Fuel Flow Indicator. Manufactured by Pioneer. Type A-15. P/N 25001-B14A-1-2A1. 2 1/4" Vintage Warbird Jet Rate of Fuel Flow Indicator. Manufactured by Pioneer. Type A-15. P/N 25001-B14A-1-2A1. Very clean item. It shows very well and it would make an excellent show piece for the bookshelf in the office or home or just as a mock up panel item. Do you happen..